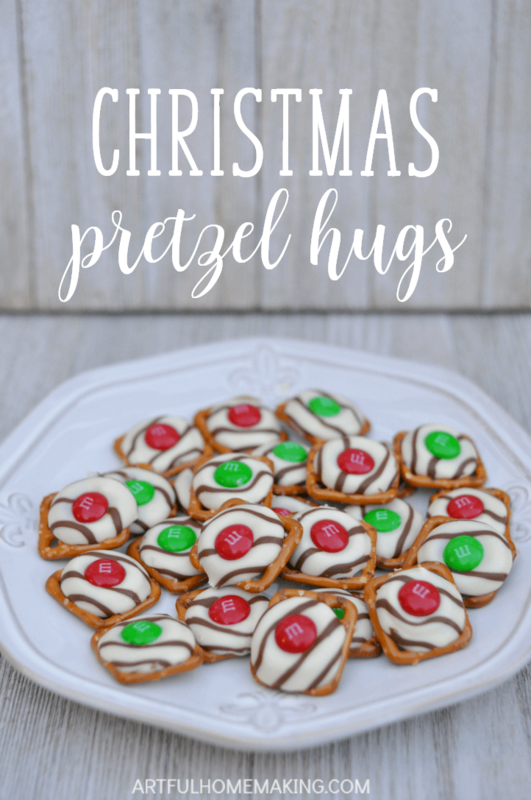 Christmas Pretzel Hugs are a classic Christmas treat around our house. 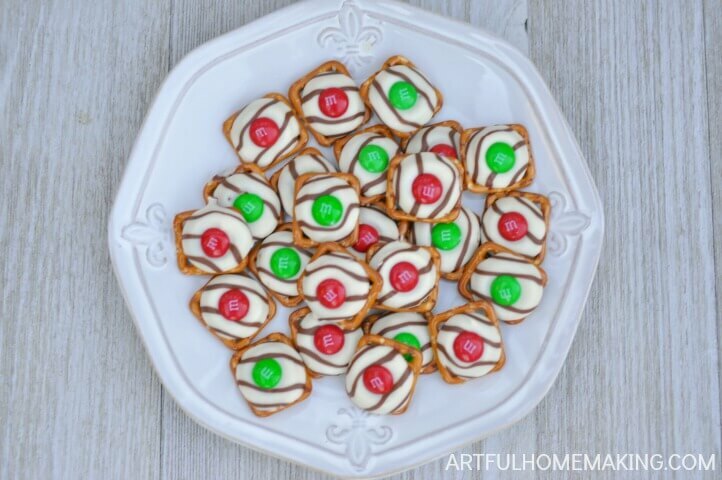 Here’s our M&M pretzel hugs recipe. This week our girls had a Christmas party to attend, and we were asked to bring a treat to share. It wasn’t even a question in my mind what we would make—Christmas Pretzel Hugs, of course! I didn’t have much time to spend on holiday baking, and I needed something that would be a hit with kids. Everyone loves these! Whenever I take them to a get-together someone always asks for the recipe. And the best thing is, they’re so incredibly simple! 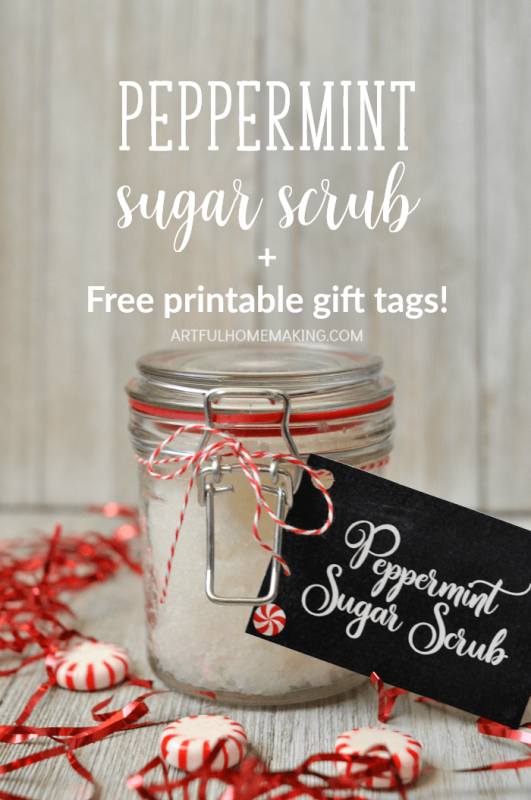 This recipe was originally posted in 2015, but I’ve updated it with new photos and text. All you do is get some waffle-shaped pretzel squares, some M&M candies, and some Hugs. 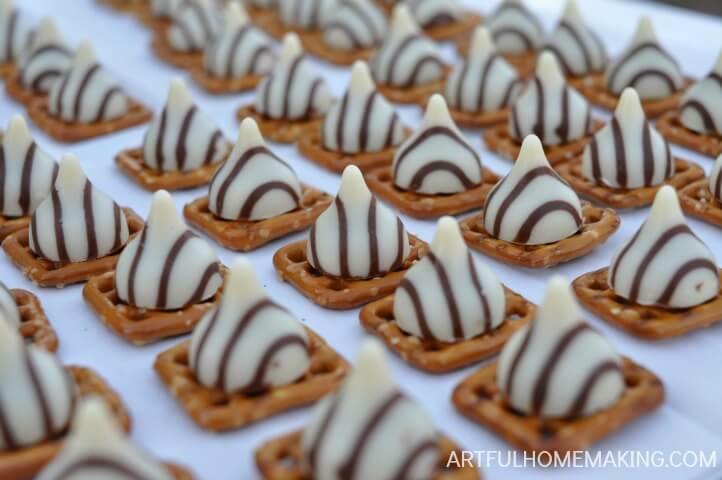 Cover a cookie sheet with parchment paper, place the pretzels on the parchment, and place an unwrapped Hug on each square. Bake at 170° for 5-8 minutes (our oven takes about 8 minutes, but I start checking a little before that), until the hugs are starting to soften but not melted. 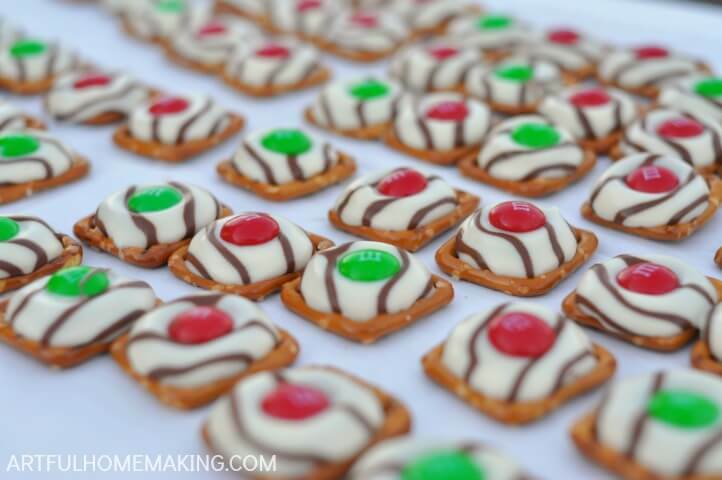 Remove the baking sheet from the oven, and quickly press an M&M candy into the center of each pretzel. This is yet another kid-friendly recipe that children love to help with! When all my children were little, I would have the youngest ones unwrap the hugs for me and put them on a plate. They can also count the number of hugs that will be used, and count out the necessary amount of pretzels. Older kids can put the hugs on the pretzels and then help add the M&Ms at the right time. Place pretzels on the lined baking sheet. Bake at 170 degrees for 4-8 minutes, until chocolate is just softened but not melted. Our oven takes about 8 minutes but I start checking before that. 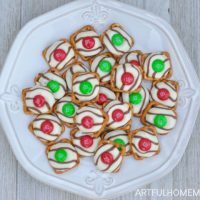 Remove baking sheet from oven, and quickly press an M&M candy in the center of each pretzel, on top of the softened hug. Cool for a few minutes, then chill for about 10 minutes in the freezer, until set (just place the whole baking sheet in the freezer). Store in an air-tight container or zippered bag. Your Christmas pretzel hugs are so cute. What a great idea! Found you at Foodie Friday. 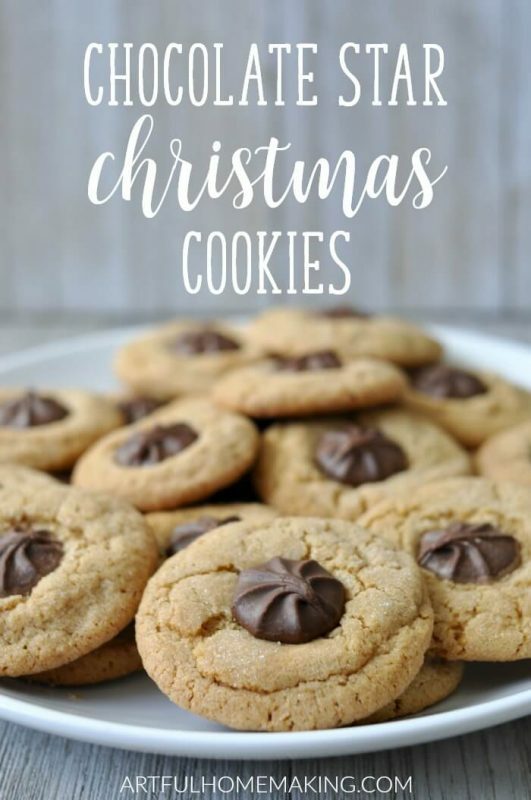 These are cute as can be and I love how easy they are! Perfect for my grandkids to help with. Thank you for sharing at Party in Your PJ’s. I pinned and tweeted! Thank you, Lexie! Happy New Year to you also! I am so sorry, Joy. The linky wasn't working properly. Somehow my candy cane cocoa was listed thrice. Please forgive me. No problem, Laura! Don't feel bad, it's not your fault—I've had it happen to me also. I'm not sure what's wrong with it, but I'm always thankful when someone goes to the trouble to link up here when the linky thing can be such a pain! 🙂 I'll remove the extra entries. Thanks so much for sharing!